Yes, even native plants can be invasive when introduced to a part of the state where they did not naturally occur. A great many plants that you may see in the urban environment of Baton Rouge are native to Louisiana generally, though some may never have naturally occurred in the places in which they now do. The baldcypress (right) is a good example. The species, which is very common in Louisiana and is, in fact, the State Tree, would almost surely not have grown in an upland area that had neither active flooding nor a high water table. The species is able to grow and thrive in many of these habitats when introduced, but in a natural setting, it would have been out-competed by oaks, pines, and other upland species. Also widely prevalent in our city, though, are non-native species. Most of these species – including all types of plants from Asian Azaleas to ginger lily – survive and grow in our climate and soils, but either lack the ability to reproduce (usually due to the dearth of a specific pollinator or climatic condition) or reproduce vegetatively but are controlled from reproducing en masse and therefore prevented from spreading into natural habitats. These species are generally known as non-native but non-invasive. These species may or may not contribute food, shelter, and/or other values for local wildlife, but they rarely cause any problems or disruptions to native ecosystems within or outside of the greater EBR Parish region. We have many examples of these because MOST non-native plants brought here that are suitable for our conditions fall within this category. Below are a handful of common non-native but non-invasive species around BR. 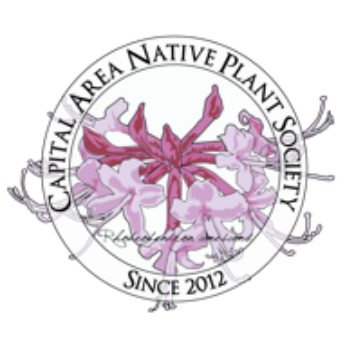 Because of the devastating impact human development has had on wildlife habitat, CANPS encourages the use of NATIVE plants in your yard or landscape, but if you are to plant some non-native species, it is surely those in this category that we would recommend. Chinese tallow is a medium-sized tree often found in shallowly flooded areas or areas with a high water table. It will often colonize open fields or fence lines that are left uncared for. The tree is one of the few in the Baton Rouge area that will readily produce a nice deep red and orange fall color, and is thus prized by many who are unaware of its destructive nature outside of the city. The waxy fruits are attractive to some species of birds, causing the seeds to be spread far and wide. Although a few birds eat the fruit, this does NOT make it acceptable, because the non-native will crowd out natives that are essential for many more species of birds and other wildlife. Chinese tallow grows rapidly in both sun and shade, is tolerant of both shallow flooding and periods of drought, is moderately salt tolerant, has no known diseases or predators in this region. It makes enormous quantities of seeds starting at a very early age that are spread by birds. The tree will form dense stands which completely out-compete other native tree species. If you have one of these on your property, we highly recommend you kill it, take it out, and plant something native! Tallow costs hundreds of thousands of dollars to control on various public and private lands across the state. Although shrubby when young, Titi matures to a beautiful, 20' to 30' tree with smooth, cinnamon-colored trunk, or multiple trunks, depending on how you prune it as it grows. In the northern part of its range the leaves may turn rusty-red in the fall; in warmer climates it will be nearly evergreen. It bears white flowers in clustered racemes about 6" long, May to July. It prefers wet to moist, sandy to medium loam. It provides nectar for bees and fruit for birds and mammals. A small-medium sized tree with nice foliage and often some decent red colors in the fall; May not do well in wet areas and/or heavy clay soils. A small hawthorn with nice white spring flower and edible fruit; can tolerate a high water table and heavier clay soils. Common privet is a multi-stemmed bush, from 1 or 2 ft. tall to 12-15’ tall, often forming very dense hedges along fence lines or in the understory below larger canopy trees. It often colonizes in people’s yards and they subsequently leave it because of the showy white flowers. The bush sprouts from adventitious root suckers and can rapidly colonize and area so densely that it becomes impossible to walk through; it usually does this following some sort of disturbance. BREC’s Bluebonnet Swamp is now literally INFESTED with privet following Hurricane Gustav which took down many large canopy trees and introduced more sunlight to the forest floor. Birds often spread the seeds after ingesting the dark blue drupes. Although a few birds eat the fruit, this does NOT make it acceptable, because the non-native will crowd out natives that are essential for many more species of birds and other wildlife. DON’T PLANT THIS, DON’T HELP IT, DON’T BE TRICKED INTO LOVING IT…..KILL IT! This is an incredibly invasive plant that is increasing in south central Louisiana and the Florida Parishes. A waxy-leaved, dark green, evergreen shrub/small tree in the cherry family; a good wildlife species. An evergreen shrub/small tree which is good as a hedge or a free-growing shrub; Females should produce handsome red berries in winter. Ligustrum is a classic plant of the old South, having been used in southern gardens for decades now. It colonizes wood edges and disturbed areas within unbroken forest, and is spread by birds which eat the drupes. Invasive ligustrum generally reaches 30-40’ tall with multiple stems and can persist in relatively low-light conditions. Do not cultivate either the waxy- or non-waxy varieties of privet. Both may displace native species where they aggressively spread within or beyond city limits. Ligustrum is a relative to Common Privet and also has showy clumps of white flowers and the leaves are arranged opposite of each other on the branches. The mature berries are purplish-black. The paper mulberry is a very fast-growing tree that grows along disturbed areas and quickly shades out native trees and shrubs. The leaves feel fuzzy and have serrated edges, and can have a variety of shapes, ranging from heart-shaped to deeply lobed. The round fruits are green and turn red when mature. Heavenly Bamboo is an ornamental shrub with multiple cane-like stems that gives it the appearance of bamboo. Some of the leaves can have a pink or red tinge. It develops cluster of white flowers that later turn into red berries. This shrub out-competes native shrubs because it spreads by seeds and underground runners. Ardisia is a small ornamental shrub that has spread into our forests and shades out native understory plants. It has semi-glossy leaves with scalloped edges. It has pretty red berries that persist a long time on the plant, making it even easier for birds to spread them. This plant should be known locally as the "Swamp Killer" as it has completely smothered our swamps in the Atchafalaya Basin as well as many freshwater river systems. The plants quickly form very dense colonies that block sunlight and out compete native aquatic plants. Don't be tempted by the beautiful flowers, we have several natives that are equally as beautiful that are being displaced by this species. Elephant ears are often planted for their ornamental appeal, however they spread in very dense clumps in wetlands and along the edges of swamps and freshwater shorelines which displaces native vegetation.